One News Page > News Videos > Donald Trump > Hannity, Limbaugh, Coulter "don't decide policy"
Hannity, Limbaugh, Coulter "don't decide policy"
President Donald Trump told a reporter during a Rose Garden news conference on Friday that Sean Hannity and Rush Limbaugh were among the conservative "voices" that influenced his decision to declare national emergency to fund his promised border wall. 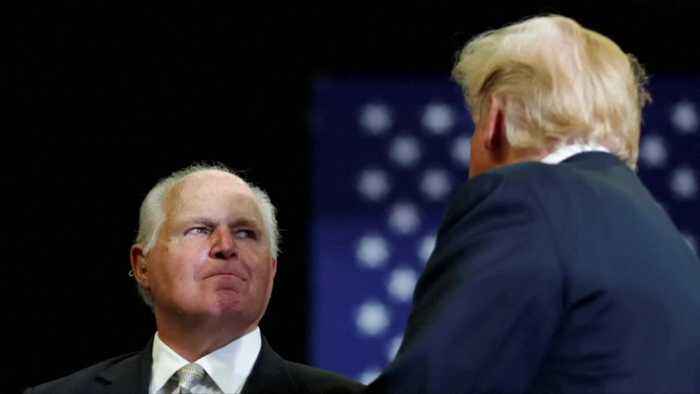 ROUGH CUT (NO REPORTER NARRATION) President Donald Trump told a reporter during a Rose Garden news conference on Friday that Sean Hannity and Rush Limbaugh were among the conservative "voices" that influenced his decision to declare national emergency to fund his promised border wall. Trump has declared a national emergency to secure funding to build a physical barrier along the U.S.-Mexico border. In a speech at Rose Garden at the White House, Trump said, "we are talking about an invasion of our country." He cited the flow of illegal drug and human traffickers, as well as gangs, at the border. He said many other presidents have taken similar steps, even as critics say his move could lead to a constitutional showdown over the separation of powers between the presidency and Congress.